a while to get used to being in a formal uniform almost all the time. 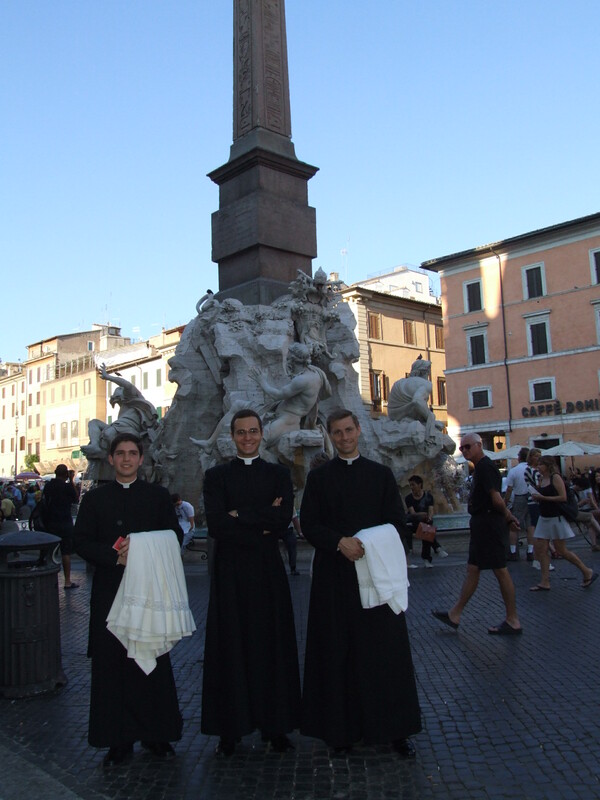 The cassock is not supposed to be worn for outdoor physical activity, but on a few occasions, I have had to make exceptions, like the night of Pope Francis’s election when I ran full-speed in cassock to get a spot in St. Peter’s Square. Not long ago, I found myself making another exception. Our seminary is located on the outskirts of Rome, where fields and open spaces are much more common than they are in the historic center. By Italian law, sheep are allowed to graze on any unused field, so the local flock frequently helps itself to the grass on the periphery of our property. 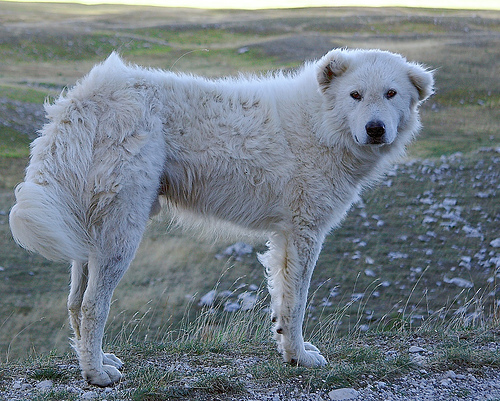 From time to time, I have come across the flock and spoken with the shepherd, who is a very nice broad-faced fellow. As his sheep graze, he likes to sit in the shade and talk on his cell phone, but he is always accompanied by a pack of Maremma Sheepdogs, Border Collies, and assorted mutts who bark at anyone who even thinks of getting close to the flock. He tells me that he tends about 600 sheep who are all doing well, grazie a Dio. After lunch one day, I was walking down by the fields with a confrere when we suddenly heard bleating. We looked down and saw a lamb that was separated from the rest of the flock by at least 300 yards. The shepherd and dogs were nowhere to be seen (quite unusual), so, being the kind-hearted seminarians that we are, we decided to guide the lost lamb back to the flock. 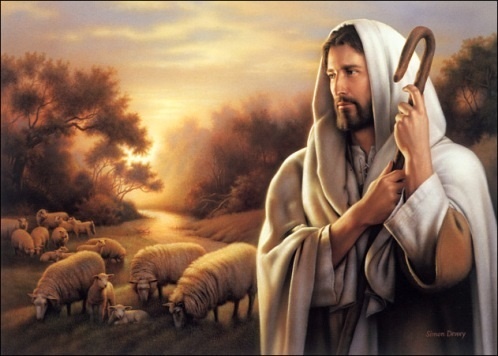 We did not want to pick up the lamb for fear of dirtying our cassocks (this turned out to be a very prudent decision, since the lamb let loose a couple of times), so we both positioned ourselves behind to guide him in the direction of the other sheep. The idea was to slowly move towards the flock, forcing the lamb ahead of us. It turned out to be easier said than done. Every couple of yards, the lost lamb would do an about-face and run directly away from flock, forcing us to re-position ourselves and try again. This went on for quite some time until we finally got the lamb close enough to a ewe that was not far from the edge of the flock. Reflecting a little later on this event, it occurred to me that perhaps God was trying to teach me a lesson for my future ministry as a shepherd of souls. 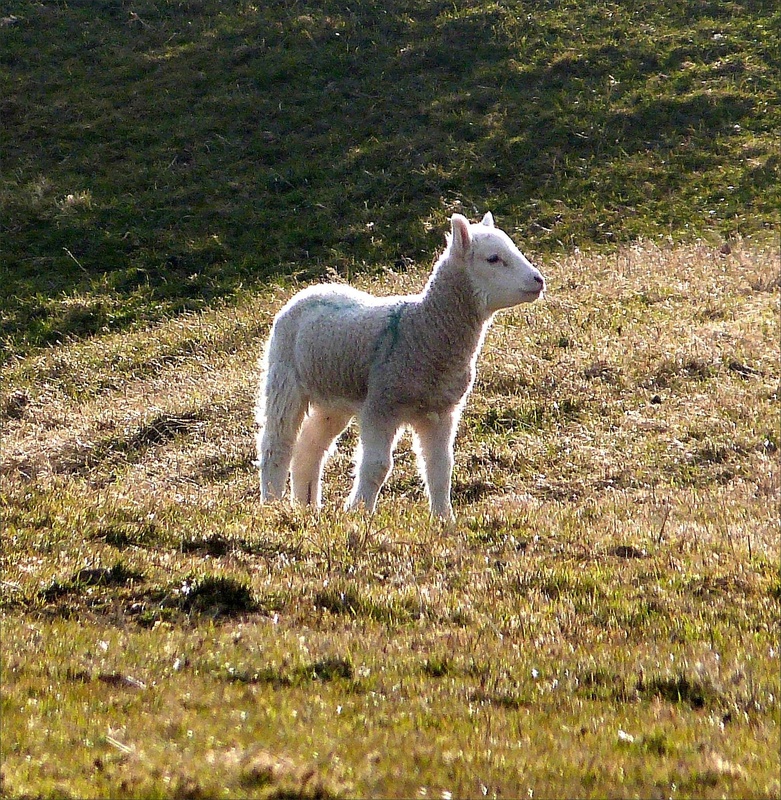 My experience with the lost lamb was similar to what Christ goes through with his own lost sheep. When we stray, he positions himself to gently guide us back, but often we stubbornly run in the opposite direction. He always respects our freedom; he never grabs us nor forces us to go the right way. But he doesn’t give up – he loves us too much for that. He stands by us, reminding us through our consciences that we are straying. If we return, his joy is more than we can imagine. As I was thinking this over in the little chapel by my room, I realized a very interesting coincidence: the Gospel passage during the community mass that morning had been the parable of the Good Shepherd in Luke 15! I took that as a sign that my experience of shepherding was not an accident…and that in the future, I will be doing more of it, albeit in a slightly different way. lambs and calves always go back to where they last sucked– there has to be some profundity there as well, but I cant find it- yet.